More About This Title Twister! This book introduces the most violent storms on Earth. 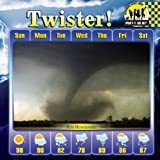 Readers will learn where tornadoes are most common, such as Tornado Alley, when they are most likely to occur, and why. Chapters highlight how storms form, the effects of air pressure, temperature, and moisture differences, wind shear, storm rotation and the formation of a mesocyclone, funnel clouds, and how spinning air reaches from cloud to ground to form a tornado. Other sections cover the dangers of multiple tornadoes from tornado families or tornado outbreaks, the variety of possible tornado sizes and shapes, storm chasers, and how to stay safe during a tornado. Why scientists study tornado damage paths, how they measure tornado strength using the Enhanced Fujita Scale, included in a sidebar, and what they look for on Doppler radar to help predict tornado formation are also discussed. Clear, helpful diagrams, full-color photographs, bold glossary words, and an index support this easy-to-read, engaging text.